Is it possible to celebrate a healthy Chanukkah? It is officially the most wonderful time of the year! This upcoming Tuesday night marks the beginning of the Jewish holiday of Chanukkah. Jews all over the world will light the Menorah for eight days, spin the dreidel, and eat loads of latkes. Latkes are fried potato patties. How could this holiday staple ever be healthy? Wanting to treat yourself to some latkes and apple sauce? First, it is important to remember that everything is okay in moderation. Levana’s comprehensive list of latke recipes and frying tips ensure that you can celebrate a healthy Chanukkah. Don’t fry your food wet! Be sure to dry your food before adding it to the pan because any added moisture will leave your food soggy. Make sure the batter is thick! The thicker the latke, the less oil it will absorb. This will produce crispy yet tender potato patties. Hot oil needed! To ensure that oil doesn’t soak into the batter, make sure the oil in the pan is hot, hot, hot. The hotter the oil, the less you will need to add any more to the pan. Don’t crowd the pan! A lot of potato batter in the pan at the same time will reduce the temperature of the oil. Instead, add more batter as you fry. No more unwanted oil! Use two forks instead of a spatula while frying the latkes. Pick up each latke using both forks and hold it over the pan. This will get rid of any extra oil and grease. Place all latkes on plates lined with paper towels to really absorb any unwanted oil. Celebrate the healthy Chanukkah season with Levana’s Vegetable Latke and Burger Recipe. 8 cups shredded vegetables: Keep the selection short and sweet. Choose from: carrots, sweet potatoes, zucchini, celery root, turnips, parsnips, mushrooms; or minced frozen vegetables: cauliflower, broccoli, spinach, beets, kale etc., in any combination you like (the shorter the selection the better; use the food processor). Even a bag of mixed frozen peas, corn and carrots, coarsely ground, will do. Your favorite seasonings (no garlic powder ever): oregano, thyme, cinnamon, cumin, curry etc. Heat the oil in a heavy skillet, about 1∕3 inch high, until very hot. Mix all remaining ingredients thoroughly in a bowl, adding a little extra flour if necessary to make the mixture stick. Form patties and throw them in the hot oil. Fry until golden, about 3 minutes on each side. Take out with a slotted spoon and transfer onto a plate lined with paper towels. You will get about 16 patties total. Serve hot, alone or with your favorite sauce and burger toppings. Makes 8 servings. 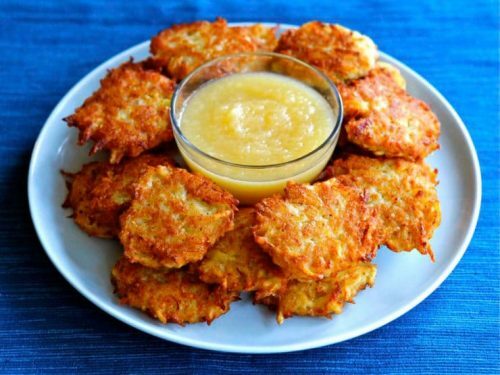 Don’t forget: every latke needs a side of homemade apple sauce! Looking for more of Levana’s healthy and delicious holiday recipes? You can find many more latke recipes and flavors here. Remember: you can celebrate your religious traditions without needing to sacrifice your health. Together, let’s make this Chanukkah the healthy Chanukkah!